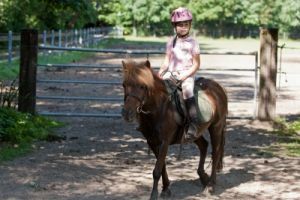 Pony and horse riding lessons for all levels and age groups! even more about pony riding. The lessons cover some basic riding skills. After five introduction lessons, the little rider may progress to a Junior Group lesson (at the instructor’s discretion). Introduction lessons can be scheduled almost every weekday. For children who have had a number of lessons and have become fairly confident in their riding, we offer Junior Group Lessons. The Junior riders learn to walk, trot, canter and do basic manoeuvres. They also learn fundamental grooming and saddling. This class prepares for FNRS dressage levels F1 and F2. Should you have any questions about the FNRS Ruiterpaspoort (booklet used to record riding experience), please ask one of our instructors. Please note: the prices mentioned above do not apply to riders having an (annual) membership. Members enjoy special rates. Together with the instructors, the lesson best suited for the rider’s abilities is determined. Please contact us at +31 (0)485-513194 of fill out the contact form. Do you have any experience riding horses or ponies? Member riders are requested to use the Cancellation form to cancel lessons.